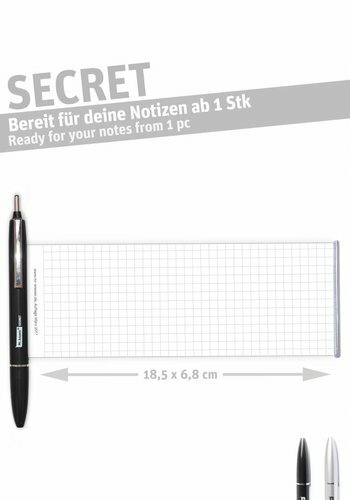 Mr. Answer Cheat Pen | Buy cheater now online! Most people probably have used a cheat sheet once or twice during exams or presentations. And every time people use it they always try to find the best place to hide it. So, they are always in the search of the best place to hide the cheat sheet. And how people hide it are different depending on the person itself. Some hide it in the water bottle while some hide it in their pocket. But with Mr. Answer cheat pen the search has come to an end! Whether it’s for exam or just to write down your notes, Mr. Answer is the best answer you can get out there. 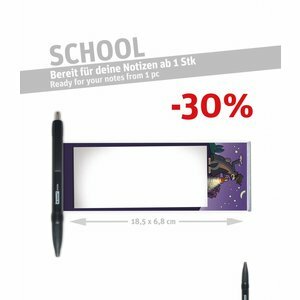 Discover our ballpoint pen with the innovative pull-out banner and you’ll never want to miss it again! Different people have different preference, which means everybody have their own favorite color. For this reason, we offer a variety of colors to choose from. From classic colors such as red or blue and then it goes to black and white and even a fine silver color. And if you wish to get more than one color for the cheat pen, you could choose the multicolor option to get the color you wanted. For the younger generation we have the Mr. Answer school, whose banner has a unique and special design which is perfect for school kids. Just choose your pen according to your liking and decide which one suits you the best. 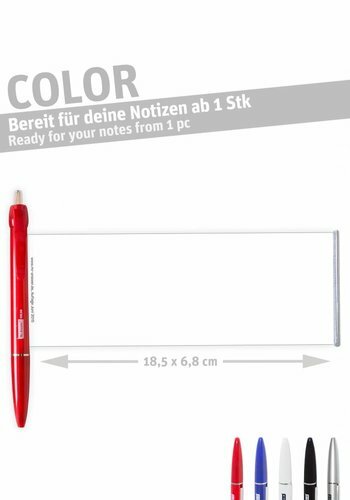 What should a ballpoint pen have, so it can be used as a replacement for a cheat sheet? It needs to be stable and discreet. It needs to have an outward appearance just like a normal pen. And that’s exactly what Mr. Answer cheat pen is! 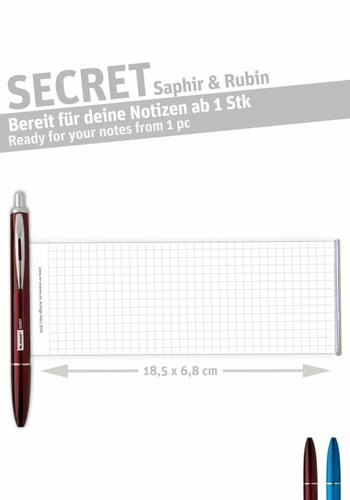 The simple but elegant design will ensure you that no one will notice any different to a normal pen. The barrel is colored in full color, so the banner inside could not be easily seen. The black ink color is TÜV-tested, so that high quality ink can be ensured. In addition, the 1mm thick lead can be easily changed and replaced, should you ever need a new one. And the fun part of the cheat pen is no doubt: the pull-out banner. It is definitely the highlight of the whole thing, because the banner is useful on every occasion. At a size of 18.5 x 6.8 cm the front and the back side of the banner can both be written on. The front side is coated with plastic, thus can be written on multiple time with water-soluble pen. 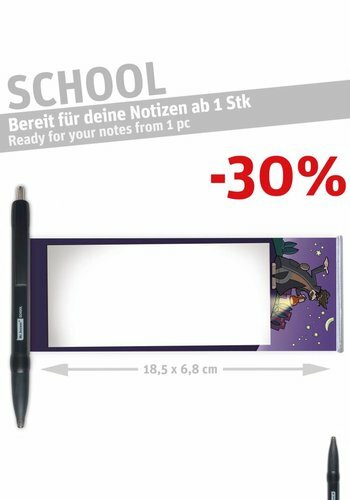 And if you use pencil to write on the back side, it means that you can use the back side for several times as well as you can easily remove the writing with eraser. And as if that’s not enough, you can even choose from several types of banner design. Whether it’s a plain or squared layout it is entirely to your own liking. Just focus on the which type of layout design is the best option for you to write better. But the fun doesn’t end here. If you decided on our new 3-in-1 touch pen and wondered what this pen could offer, we have just the right answer. Smartphones and tablets are now everyday essentials, so why not use this opportunity to enjoy a simpler operation? Our Mr. Answer touch pen has a rubber tip that compatible to almost all the touchscreens, so you could easily avoid any horrible scratches on your smartphone. But there’s more! If you enjoy listening to music on your phone but afraid that the headphone port could somehow break because there’s dust in it? Then again, the 3-in-1 touch pen will help you solve this problem! Thanks to its headphone jack protector you’ll not see any dust on your headphone port anymore! 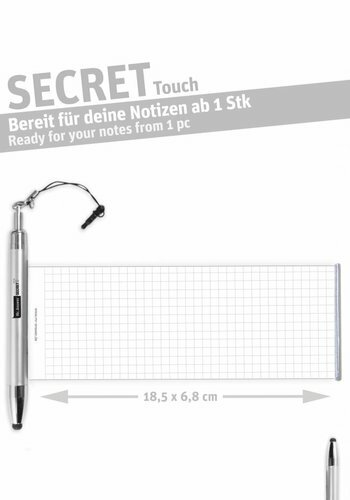 You’ll get a very versatile pen in the end, although want you really wanted to have was only the cheat sheet. A win-win situation! And what can he be used for? Basically, for every situation that requires you to take a note and anyone who feels like the need to have one or two cheat pens in their life. It doesn’t matter if you are a school kid, student, or trainee. Or maybe you are an office worker and are in the search for a product that could help your everyday life? There are many examples on how you can use the pen. The best example would be if there’s a test or an exam. We did not name the product cheat pen for nothing. Simply use the pull-out banner to write down the important and necessary information and just go casually to your exam room. Another example is to use it during your presentation. You could use the pen to point out an important subject on the whiteboard. And should you have forgotten a part of your presentation or unsure what to do next, just pull-out the banner and check your own notes. But our banner could bring a benefit as well in the world of work, say you need to give a lecture or conduct a discussion or meeting with your client. And even in daily basis you could use the banner to write down your shopping list, your schedule for a day or even a list of attractions you need to visit for your trip. Mr. Answer will help you on every occasion. And these are our cheat pen! We have put together a variety of products for you, all with their own individual advantages and strengths. Just pick the cheat pen that suits you the best. Our standard model Mr. Answer COLOR offers you a wider variety of color choices. Here you have five colors to choose from and there’s also an option to request for a multicolor version. 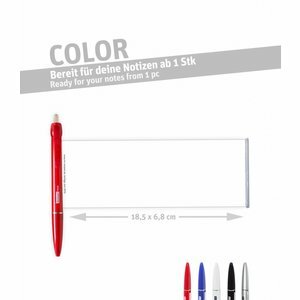 The plain pull-out banner gives you the freedom to write or draw whatever you want without any annoying lines. 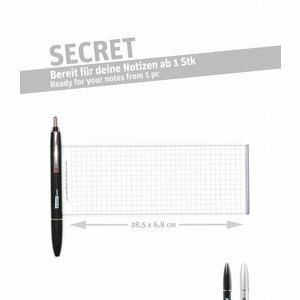 Our featured cheat pen, which comes in three different types. All of them shared the common squared design for the banner, which makes it easier to write down notes. They also have the option of multicolor as well. The basic Mr. Answer SECRET offers the standard color of black and silver, that are quite similar to the Mr. Answer COLOR. And then there’s the new variant of Mr. Answer SECRET sapphire and ruby, which just like its name offers a special and very pretty sapphire and ruby color. But the coolest type would be the Mr. Answer SECRET Touch. 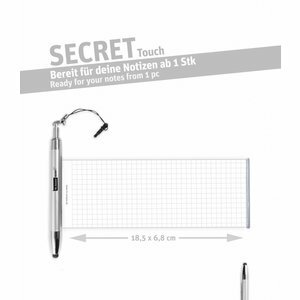 With Mr. Answer SECRET Touch you get a 3-in-1 pen, which has a several features: pull-out banner, touch pen, and protector to your headphone port at the same time. Thus, the best companion for you mobile devices users out there! Of course, we also thought of school kids out there who would like to have some fun with it. With Mr. Answer SCHOOL you get a sturdy cheat pen with a black ink. Mr. Answer SCHOOL has a rubber grip as well that lets you write comfortably. The banner itself has a special design for children that makes you instantly smile when you look at it and serves as a framework at the same time. The front and the back side of the banner can both be written on as well. 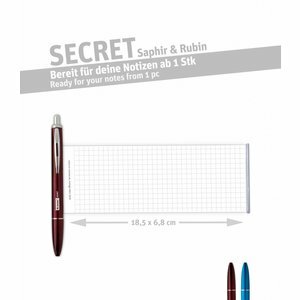 Grab your Mr. Answer cheat pen now, quick and easy at our online shop! So, you decided for our Mr. Answer cheat pen? We’re happy to hear that! Simply order online through our shop and you’ll get your pen in no time thanks to our quick delivery system. Don’t forget we also offer an appropriate discount if you order more than one pen. For example, if you want to have 10 pens of one type, just click on the quantity bar and choose 10 pens instead ordering 10 times. And that’s how you’ll secure a good discount! If you have any question regarding our products or your order, feel free to contact us. You could use the form on our contact page. We look forward to your next purchase!